We're thrilled to be bringing Tom Jackson Productions in for an intense 2-day event designed to help our artists take their performance skills to the next level. This event is for all performers (solo artists, duos, full bands, freelance musicians) from across genres. Learn how to become a stronger performer (no matter what level you are currently at), a more desired side person, and really connect with your audiences! Tom and his team will teach you how to create moments in your live shows that will result in dedicated fans, and a connection that can increase your album and merchandise sales! Tom Jackson has helped hundreds of signed acts and indie artists “get their show together” for showcases or tours. Tom’s experience as a musician, passion to help artists and unique insight has qualified him as one of the premier performance consultants and live producers in contemporary music today. He is in demand across North America, and has appeared at most of the major Canadian conferences. 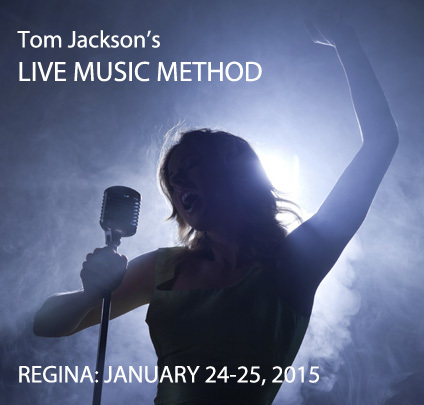 The weekend will include performance demonstrations utilizing local artists, workshops, and 1-on-1 coaching sessions with Sask artists from a variety of genres that you'll be able to observe. This is a rare opportunity to learn from this in-demand coach. And it's being offered FREE to Saskatchewan artists! Artists, individual musicians and artist managers may register before JANUARY 20 by visiting www.saskmusic.org/workshops or calling 1-800-347-0676. (If you've already registered, please disregard; you will receive a confirmation and other info on Monday.) Registration is FREE for Saskatchewan residents. If you’re from outside Saskatchewan, you’re welcome to attend for a registration rate of $100/person. Song submissions for our 2015 In Tune compilation CD must be in by 5pm Monday! The 2015 version, which will continue our series of successful compilation projects, will be intended for promotion and distribution to Canadian media and industry professionals, as well as some international markets. Thousands of physical CDs and download cards will be distributed at music industry events such as SXSW (U.S.), BreakOut West (Victoria), JUNO Week (Hamilton), Canadian Music Week (Toronto), NXNE (Toronto), The Great Escape (U.K.), Reeperbahn (Germany) and other national and international events that SaskMusic will have a presence at throughout the year. This compilation will serve as the calling card of Saskatchewan music worldwide. Representing the best freshly released music by our province’s diverse array of artists, it enables SaskMusic to highlight a curated selection of songs that opens doors to showcase opportunities, radio airplay, publicity, and licensing opportunities for our artists. We are seeking song submissions from emerging artists and established artists alike. We hope to include representation from all genres, and from across Saskatchewan. Submitted tracks must be release-ready. Submissions must be made online at https://saskmusic.wufoo.com/forms/in-tune-2015/ prior to the deadline of Monday January 19, 2015 at 5pm. If you have any questions about this opportunity, please contact SaskMusic at 1-800-347-0676 (toll-free in Saskatchewan), 306-347-0676, or info@saskmusic.org. DEADLINED PROGRAMS INTAKE CLOSES JANUARY 23! Creative Industries Production Grant - supports individuals and businesses in the production and refinement of creative products, ensuring greater market and commercial readiness. Market & Export Development - provide support to individuals and businesses for market access and market development opportunities. Examples of music marketing activities might include branding/artwork, photography, publicist or radio tracker fees, printing, promotional videos, advertising, web design, and travel for promotional purposes. Research Grant - projects that focus on creative industry based research, market intelligence activities, business skills growth, or industry talent development. or training that improves business skills; learning opportunities (including mentorship programs, work terms or internships) that support industry capacity and job growth in Saskatchewan, and improve workforce readiness through skill and expertise development within the industry. Remember to read the Investment Program description & Guidelines document in addition to documents for the Program you're applying to. Market Travel (showcasing), Sound Recording, and Tour Support grants are also open for applications at any time. For more information, visit www.creativesask.com. Complete your Artist Profiles now! It's a good idea to submit an artist profile by this date even if you aren't applying for recording assistance this time - then you'll be ready to go should you receive an opportunity such as a showcase invitation, where you'll want to apply to the Live Performance Program!